Exactly What You've Been Waiting For. 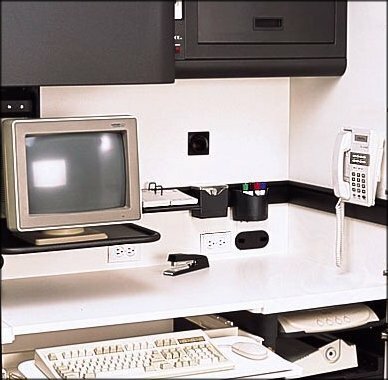 Shown with standard equipment including chair, UPS, tool bar and accessories, telephone, mobility system, hardware and fittings. Requires only a single 110 volt electrical outlet and a phone jack for full operation. Fully wired. Fully mobile. Even the chair closes up inside. The Professional model is 48" wide, 28" deep, 77" tall, weighing approx. 750 lbs. (shipping weight), this model has a single door with a flip-up task table, giving you an L-shaped work area. The Professional is the equivalent of the main cabin of the CEO model. The difference is that, on this model, instead of the bottom right file drawer seen on the CEO, here you have a spacious printer glider . CPU mounts on underdesk rib. Finish choices are mahogany or whitewashed oak, and like the CEO, this model comes fully equipped. The Professional will accept up to 19" monitors. Please see: Monitor size information. This model offers equipment siting flexibility. Oversized CPU's can be accomodated by placing them at far right of desktop. (Plugs and grommets are already in place to accomodate over-sized CPU's, and the speakerphone may be relocated to desktop if desired.) 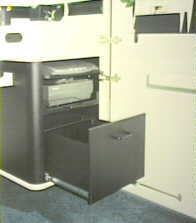 Printer compartment, with dimensions similar to standard file drawer, is sized to accept multi-function fax/scan/copy units. Fax glider shown above printer will also accept most scanners. Overdesk storage compartment to right of monitor housing is wired as well. Many designers have chosen to have matching bookcases manufactured locally. Got a LOT of computer equipment? Take a look at the Executive model . Specific questions? Just ask. Send Inquiry. * Standard Equipment. FULLY EQUIPPED! 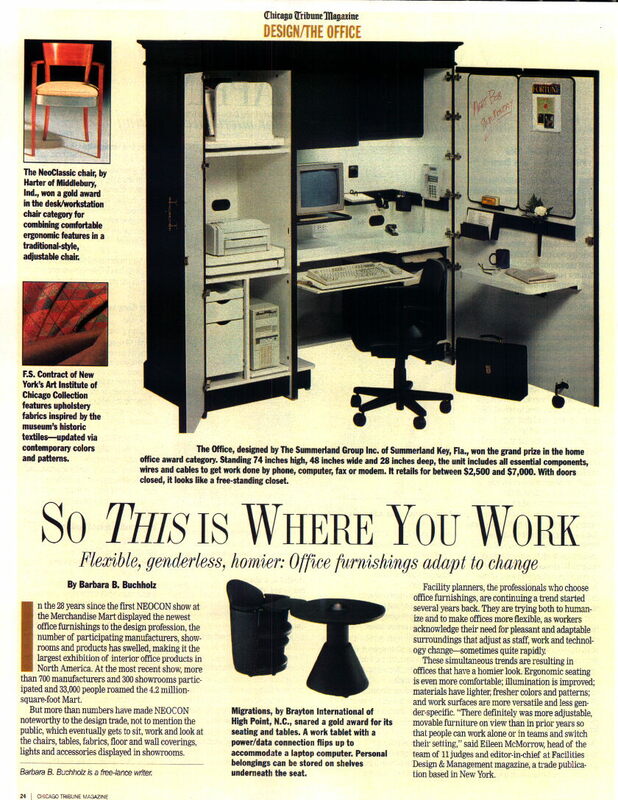 Wondering how The Professional model of The OFFICE compares to other computer armoires? (We thought you might be). Even the chair closes up inside! The OFFICE requires only a single 110 volt electrical outlet and a phone jack for full operation. MODEL CLOSE OUT SALE - just $3495. F.O.B. Factory, Fort Worth, Texas. "What impresses me most about this concept is the care that has gone into the design and construction of The OFFICE... an extraordinary achievement in furniture, efficiency, and technology ... everything you need in an office... especially well suited for heavy computer users... beautifully designed... the highest quality, most durable unit possible..."
Haut Decor International Magazine "The OFFICE is...a sophisticated new computer appliance..secure, attractive, non-intrusive, professional...It can be relocated to the employee's home and is even wheelchair accessible"
AXIS - the magazine of the South Florida Chapter of the A.S.I.D.
" ...the way people work has changed. Computers have all but replaced typewriters. The study of Ergonomics, (the relationship between man and his working environment, with special reference to anatomical, physiological, and psychological factors; human engineering), has changed the way we look at human physiology within the workplace. What has been largely overlooked in the equation, however, is the pressing need for today’s workplace to also be Electro-entopic - (from the Greek-entopos meaning: in its correct place). The term Electro-entopic, describes ergonomically correct placement within the workspace, of electric, electronic, and mechanical components, as well as functional task areas. .....Summerland's product, The OFFICE™, was awarded International Grand Prize in Home Office competition at NeoCon, the World's Trade Fair for Interior Design, Facilities Management & Communications. The OFFICE™ and their newest line, The Learning Station™, a wide variety of mobile, height-adjustable desks which convert to computer workstations at the touch of a switch, can be found on the World Wide Web at http://www.the-office.com"
The OFFICE™, designed by The Summerland Group.. won the grand prize in the home office award category. Facility planners, the professionals who choose office furnishings, are..trying both to humanize and to make offices more flexible, as workers acknowledge their need for pleasant and adaptable surroundings that adjust as staff, work and technology change--sometimes quite rapidly...[The OFFICE] includes all essential components, wires and cables to get work done by phone, computer, fax or modem"